Instrument P.I. : Matthew Geoff Mcharg, United States Air Force Academy. Technique: Intensified high-speed imaging and slit-less spectroscopy. Scientific objective: Provide spectral (and imaging) information at a rate of 1000 frames per second for detection of ablation anomalies, flicker in bowshock emissions, spacecraft rotation, and wake. Instrument: The instrument consists of a digital intensified CCD camera capable of 1000 frames per second, equipped with a 600 l/mm objective transmission grating. Heritage: This camera was deployed during the Genesis SRC entry observing campaign. Stored away for takeoff and landing. No rack requirements. Aircraft hardware requirements: Window swivel mount. Electricity at window. Stow box. 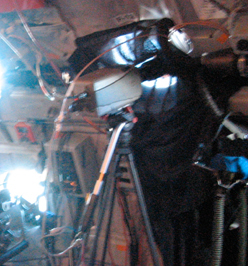 Instrument validation tests: This camera has been used in past missions and was tested during ground-based field campaign in June and July 2005. Dynamic range: 12-bit (factor 256). Frame rate and exposure times: Exposure time: 1/1000s. In first order: 2 nm. 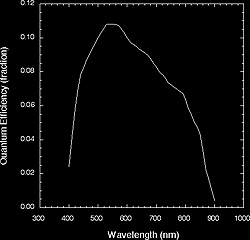 Provides spectra covering 170 nm wavelength range within the spectrographs range of 450 to 900 nm, depending on position of the SRC source. We expect most data in the range 640 to 810 nm.